What year did the U.S. Bureau of Reclamation complete the earthen-filled dam creating Prosser Creek Reservoir? Acccording to the calendar and the weather, Fall is in the air. The mornings are dewy & evenings are brisk; with nighttime temperatures into the high-30's. Ground vegetation is drying & fallen pine-needles are forming soft mats on the forest floor. All, a precursor of the aspens, cottonwoods & alders turning gold.The "second season" has arrived. The running waters are low, clear & cooling; the lake inlets' magnetic effects are gathering early migrants for the Browns upcoming spawn. 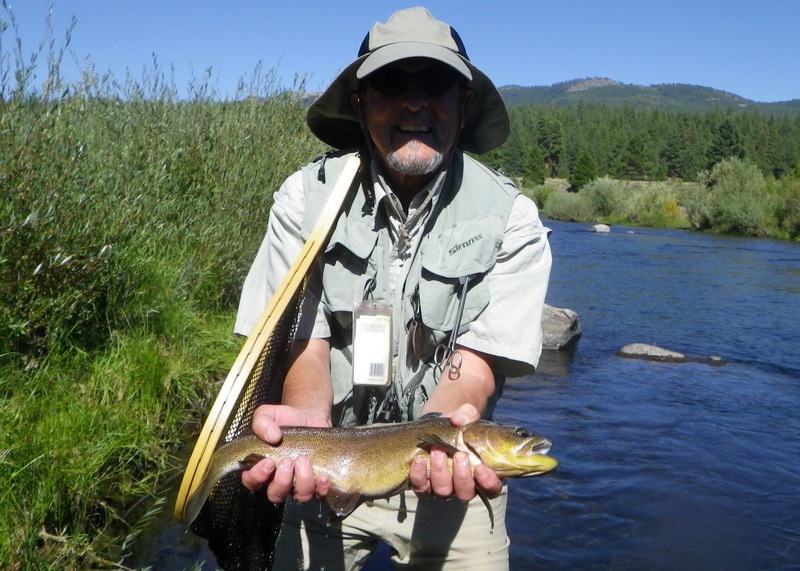 Trout are are more eagerly eating our flies & there are few flyanglers on the local waters. The moving waters currently overshadow the lakes relative to the places of choice to cast the fly; although there is one particular unnamed lake or two (...or inlet, HINT). all types of water start to fish quite well now, through October, into Novemeber and/or until the snows progressively eliminate access. Q----How has it been for the past couple of weeks? Will the fishing be any good next weekend in Tahoe? A----I’m not a clairvoyant & seldom with complete assuredly predict what is happening in advance, but fishing has been pretty decent the last three weeks and I feel it will continue. Admittedly I’d like to see more cloud-cover though. The days have been mild. The waters are low & clear but we’re catching trout on the big Truckee up to 17”. 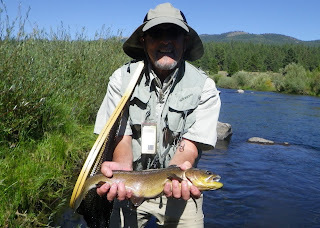 Most are 8”-12” wild rainbows & browns…90% being the former. Producing methods have been dry/dropper and indicator rigs; the latter being the most productive. We’ve been working the water above Hirschdale all the way to Trout creek (low flows here but the trout are willing). I’m seriously thinking about using a 4 wt in the upper section because the fish are smallish, but very aggressive and feisty. They are eating small flies. The best fly has been a #18 BHFBPT, followed by #18 Micro-May or #16 Rubber-Legged Copper John…either trialing a #14 Flesh Juans while fishing deep or a #14 Stimulator in a dry/drop ser-up. I’m dropping the sub-surface fly under the Stimulator longer than normal; 24”-30”. AM’s have been the best time and it slows in the early afternoon. As the sun fades the last 1-1/2 hours perks things up as far as willing trout. Leaving at 2PM I haven’t recorded a water temp of over 63…a decent temp. There are few aquatic in flight and the hoppers remain thick. But, if there is no wind…hasn’t been a lot…hoppers are not haphazardly landing in the water; so I haven’t used specific hopper patterns since there not always available. As for the Little Truckee*….forgetaboutit!. I’m not taking any clients there right now because the water is way too low at 15-17 cfs. During a Bureau of Reclamation 6 year inspection it was noticed that a gasket was leaking or defective. They are working on it now. Until that is completed and the flows are increased I will not fish it or take clientsthere…the trout are really exposed to predators right now and that includ us! Prior to thge ramp-down when it was 110 cfs there were sippers that moved to sized #22-24 Organza Spinners. Most were not hooked becuase of the tiny flies even though the gaps were opened (...off-set the points). *NOTE: As of 9/23 the LT repairs are done an currently the flow is 157 cfs...good fishing flow. The BT remains a good choice in the AM. Few bugs are in flight and there remains few rising trout. OK, thought I'd step it up a bit and make the trivia a bit more challenging. Maybe it was too challenging. "...Since the Truckee River is designated as a navigable river, the Club asks that those floating the the 2.7 miles of river respect the fact that the waters as designated "Fly Fishing Only---Catch & Release" and respect the fact that shorelines are the private property of the Club for use by members and guests. The Club supports a number of fishing-related groups and respectfully requests that same support in return." No live bait, use of artificials required; all cutthroat trout must be released; limit five kokanee salmon or brook trout. Seven primitive walk-in campsites, with bear-proof food storagebox, picnic table and fire ring provided; no developed, piped water orgarbage service (pack it in, pack it out); first-come, first-served; $10 per night, maximum of six people per site. Three 14-foot aluminum boats with 10-horsepower 4-cycle outboards, $50 day, $25 half-day; eight kayaks, including two tandems, four pontoon float tubes, $20, $10. OK on trails and in campsites, must be leashed. No watercraft permitted except for rentals, no hunting or firing guns, no campfires outside of designated rings at campsites, no smoking, firewood cutting, felt-soled waders or live bait. turnoff marked "Independence Lake, Webber Lake, Jackson Meadow Reservoir." "Independence Lake - 5 miles"). Turn left and drive 2 miles (becomes dirt,rough for some vehicles) to a fork (signed "Independence Lake - miles"). Take right fork and go 0.5 of a mile to another fork. Bear left and drive across a stream (if you do not drive across a stream just after taking this fork, you have taken the wrong fork), and continue to signed entrance road for Independence Lake Preserve. High-clearance vehicles required.